ISFJs are interested in maintaining order and harmony in every aspect of their lives. They are steadfast and meticulous in handling their responsibilities. Although quiet, they are people-oriented and very observant. Not only do they remember details about others, but they observe and respect others’ feelings. Friends and family are likely to describe them as thoughtful and trustworthy. ISFJs are warm-hearted and compassionate individuals who are always thinking of others before themselves. They enjoy working in fields with long traditions where they can apply their kind nature and analytic skills. They excel in social work, medicine, and academics for example. Emotionally oriented, ISFJs are sensitive to other people’s feelings and have a deep understanding of their own. At the same time, they are grounded by logic and reasoning and can always look at situations for what they are in a practical manner. This makes them detail oriented, they are always able to get the job done with precision and accuracy. Even though ISFJs might have a tendency to procrastinate, they thrive on the pressure of the last minute and will always deliver on time. Although quiet and private, ISFJs also have an uncanny ability to relate to other people on a personal level when it’s needed. They can offer great insight into the human condition, but don’t expect it to happen often. ISFJs are well-known for keeping their thoughts and feelings to themselves most of the time. ISFJs like things to be orderly, and they also have a uniquely creative side. They tend to have aesthetically pleasing living spaces because they put a lot of thought into the design and flow of their house. They have a knack for making friends and family feel safe and welcomed in their presence. But because they are always thinking of others’ needs, ISFJs become vulnerable to being taken advantage of. Without proper praise for their accomplishments, ISFJs can easily become distracted by negative and self sabotaging thoughts. Although they think highly of others, they tend to be far too critical of themselves, always expecting perfection. This perfectionism works both for and against ISFJs. Overall, ISFJs are thoughtful and generous individuals who are dedicated to making a change in the world with their kindness and commitment. They are emotionally intelligent, while also always taking a practical approach to life. Balanced and well-rounded, ISFJs are likely to succeed at anything they set their mind to. Check the ISFJ Friendship experience. Check the ISFJ Romantic Relationships. Check the ISFJ Family Life and ISFJ as a parent. Check the ISFJ Education Experience. Clergy, Early Childhood Educator, Interior Decorator, Librarian, Nurse, Office Administrator, Secretary (More). 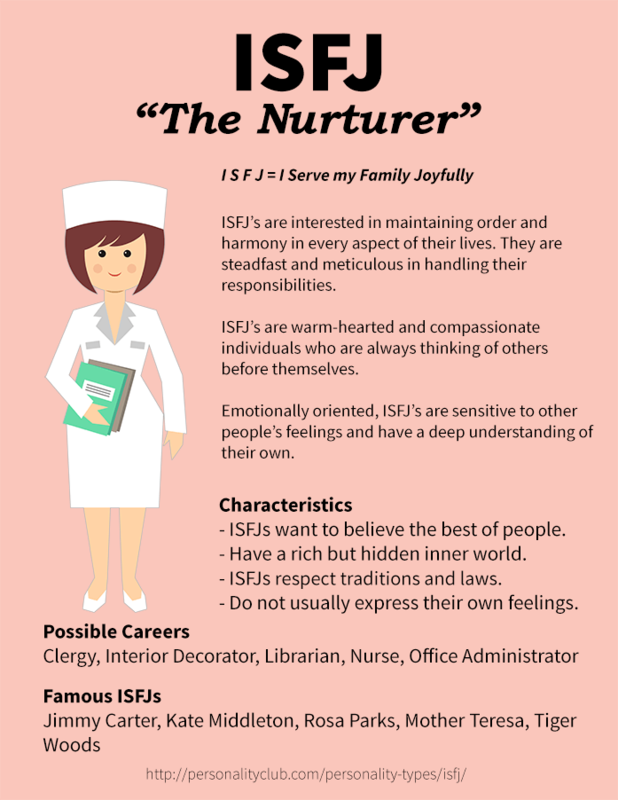 For in depth analysis check the ISFJ Career Path. Check the ISFJ Typing Confusions.